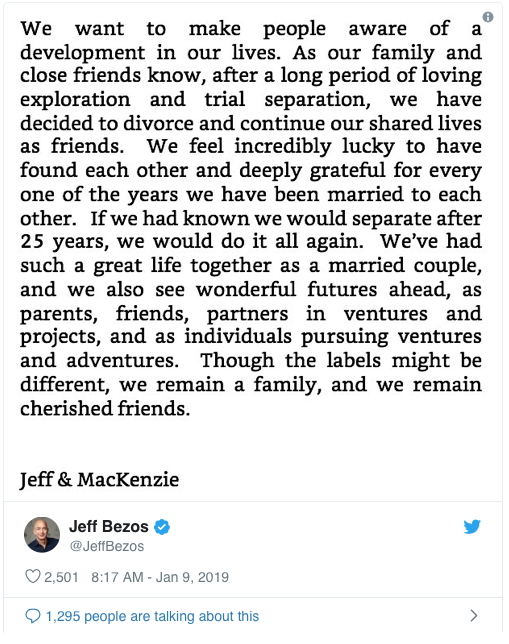 Jeff Bezos, CEO of Amazon, and wife MacKenzie have decided they are getting a divorce after 25 years of marriage. In a shared tweet on Wednesday, January 9th 2019, Jeff Bezos stated in a tweet, “We want to make people aware of a development in our lives. As our family and close friends know, after a long period of loving exploration and trial separation, we have decided to divorce and continue our shared lives as friends,” signed offf by both Jeff and MacKenzie. Jeff Bezos has a reported 800 million shares in Amazon estimated to be 16% of the largest e-commerce company in the world. In 2018, Jeff's net worth had climbed to a reported $168 billion making him the first man in the world to have a net worth exceeding $100 billion. In January 2019, his net worth is reported to be an estimated $137 billion. Given that Washington, where he and wife MacKenzie reside, is a community property state, MacKenzie is entitle to half of the property owned by the Bezos couple. If she is to receive half of $137 billion, she will become the richest woman in the world and this will become the most expensive divorce in the world. In 2018, the couple launched a charitable fund together called the Day One Fund which has committed $2 billion to academics and families. The couple reports that they will continue to share their lives together as friends and continue to work on their charities. MacKenzie is well known for grinding it out with Jeff Bezos in the early creation days of Amazon. The couple was married in 1993 and Amazon was formed in 1994 making Jeff's shares in the company community property. They own several houses and many properties across the United States, all expected to be community property and evaluated during the divorce. The couple has stated that they have considered the divorce for some time and have even experienced a trial seperation which may conclude that this divorce will be resolved outside of courts.